Just play games and make money? Where do I sign? But the fascinating part of this story isn’t Pewdiepie (who, by the way, is talented, intelligent, and kind) it’s the literal thousands of people making a living playing video games on the internet. Not only is this middle class responsible for the vast majority of professional creators, they also represent most of the views and revenue. Does it fit nicely into a headline? No. Are they making millions of dollars a year? Rarely. Many of them are making just enough to quit their day jobs, while others supplement other income. The vast majority of people trying to make it work, of course, cannot. The low barrier to entry ultimately creates a ridiculously crowded market and turning that video of you playing Call of Duty or Happy Wheels into a thriving community of active viewers is not something that just happens. We are, for this article, going to disregard the talent and thought and strategy and work and work and work that go into crafting good gaming content because that’s fairly true for anyone working in online media. What is really remarkable to me is that, even after all that work, gamers have a much tougher go than the average YouTuber. Here’s a discussion of why. The online video ecosystems thrives largely on ads. Gaming content is exactly what YouTube wants (the videos are long, the audiences are engaged, and thus people stay on the site.) So YouTube does their best to build the gaming community, but monetizing it is a different story. There is so much popular gaming content on YouTube that for much of the year, the inventory far outstrips advertiser demands. Only during the fourth quarter do ad rates start to approach what the rest of YouTube expects throughout the year. Accounting for the lean times doesn’t make building a business on this content easy. The viewers of video game content on YouTube are young and savvy. They are exactly the sort of people who tend to enthusiastically install ad blocking software. Oh God, this is terrifying. 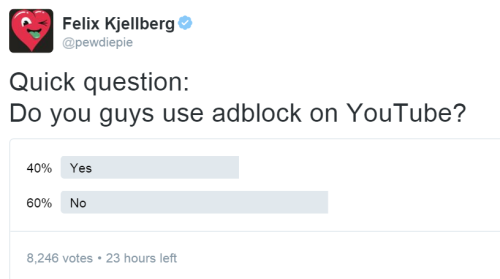 Creators get paid based on whether ads play on their channels. If the ads don’t play, creators don’t get paid. The rate creators get paid per ad is lower, but that doesn’t even account for the ads that don’t get served. Game producers are inconsistent with how they enforce their copyright. Some encourage gamers, even paying them to play their games. Others (notoriously, Nintendo) will claim your video and all of the revenue it produces if you upload gameplay from one of its systems. Gamers with large audiences have the ability negotiate nice contracts with their MCNs, YouTube is better at selecting them for higher quality advertisements, and brands looking for the biggest bang for their buck are more likely to single them out for lucrative brand deals. But if you’re small-time (by which I mean, you only have the viewership of the median cable TV show) your ad rates are lower, your brand deals are sparser, and the cut your MCN takes is higher (as high as 40%). Sometimes as much as six to eight times higher than a high-level creator. Many YouTube gamers specialize in one game. Often this game is Minecraft, but it might also be Smash Brothers or League of Legends or Starcraft or any of dozens of others. If your game alienates its user base, puts out a crappy sequel, or simply goes out of style, you might just need to start polishing up your resume. Despite all of this, YouTube gaming is obviously working…and for a lot of people. Estimates of professional YouTube gamers range upwards of 10,000 people. They don’t make 100% of their money from YouTube ads, but they couldn’t make it work without them. Gamers do have other paths to help them achieve sustainability, one of which isn’t open to many other creators (at least, at the moment.) Twitch.tv’s streaming platform creates a place for people to build audience, monetize more effectively, and to develop a more significant relationship with existing fans. As audience size inevitably wanes, for some gamers Twitch is a place to move your most engaged viewers who are most likely to support you with voluntary paid subscriptions and donations. This video of people receiving massive Twitch donations is a reminder of how many rich people there are in the world. Brand deals, if you can get them, are more plentiful in gaming as there are obvious endemic sponsors (the $22B gaming industry) that creators with a broader focus don’t always have. And YouTube Red distributing revenue based on watch time (not views) gamers (with their longer content) are poised to benefit more than the average creator. 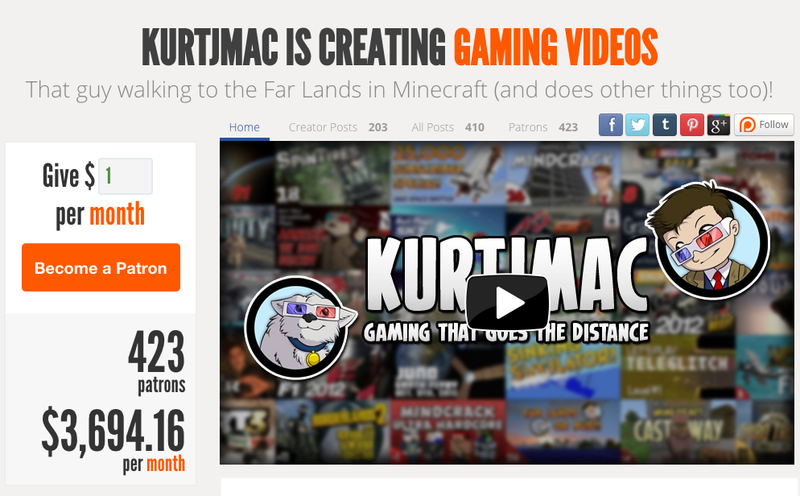 Many gamers are able to supplement their income through the voluntary subscription platform Patreon as well. This works especially well for creators who have developed strong relationships with their communities that go far beyond viral content or a simple affinity for whatever game they play. If it seems like a fad to some, to me it looks like it’s just beginning. Hank Green is a professional YouTube creator and has been for the last eight years. In addition to co-founding Crash Course, SciShow, and the Vlogbrothers channel, he has a very small gaming channel (GamesWithHank.) He is also the CEO of VidCon, the world’s largest convention for the online video community.